'Whiskey Mack' RB (Henry Danielson, R. 1982). Seedling 77-9. AB, 30" (76 cm), Early midseason bloom. Standards heavily veined gold, violet veining on midrib with rust brown coloring next to style arms, gold edge; Falls same. 'Stars Over Chicago' X 'Genetic Artist'. Pleasure Iris Gardens, 1982. From AIS Bulletin #245 April 1982 Introducing WHISKEY MACK-Sdlg. R-77-9. AB (1/2),30", M-L. Flower is edged in gold on both standards and falls including stylecrests. Standards have gold veining. 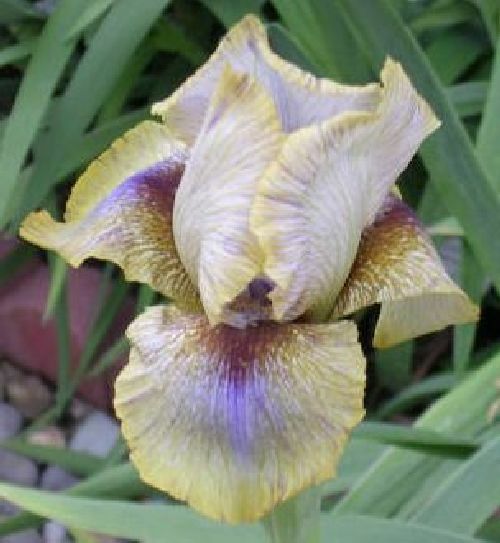 Midribs are veined violet with rust brown coloring next to stylearms. Falls same. Standards are somewhat open, but this only adds to the beauty of this flower. The coloring is difficult to describe, but it is a real eye catcher and makes you wonder whether it is real or artificial. Stars Over Chicago X Genetic Artist. $35.00. Pleasure Iris Gardens.